You’d think you already knew everything about the controversial rapper who isn’t afraid to say what’s on his mind, but it seems Mr West has a few skeletons hiding in his closet. We know the obvious – his love for reality star, Kim Kardashian, his global music success, and well, I think we’re all aware that he can come across as super-crazy – but what in the world has Ye not shared with his millions of fans? He dedicated a few lyrics to his pops on The Life of Pablo, but I’m sure you’re one of the many to wonder about Kanye’s father. Ray West was a black panther in the 60’s and 70’s before becoming one of the first black photojournalists at the Atlanta-Journal Constitution. According to Kanye, “My father was a paparazzo himself. My father was a medical illustrator, a Black Panther, a Christian marriage counselor.” With such a strong role model in his life – it makes sense that Kanye has passionate views and wants to share them with the world. Ye had quite the interesting up-bringing. Born in Atlanta, Kanye later lived on his own with his mum in Chicago, after his parents divorced at the age of three due to “financial issues”. His mum Donda, who passed away in 2007, was an English University professor and they moved to China for a year whilst she was a visiting professor there. Kanye was 10 at the time and apparently quickly picked up the language, although he has since forgotten most of it. He’s known to get involved in various celebrity feuds but did you know that Kanye also often fights with the paps? With numerous encounters with the photographers, Kanye literally despises them. He even went as far as to say “he hates them more than Nazis” in one of his records. When he was grilled about this by a journalist, his lawyer was quick to shut down the conversation and walk away from the interview. Kanye has faced charges in the past of battery and attempted grand theft when in connection with an LAX attack, where a photog claimed that Kanye injured him. Well, there’s no denying that – the Yeezus rapper was photographed wrestling the man to the ground. Insane. It’s not surprising that Ye sits on this amount of wealth. He immerses into a lot of business ventures including music, fashion, architecture, technology and film. Oh, and he’s married to one of the most famous and richest women in the world – none other than Kim Kardashian. Kanye bagged himself a scholarship at Chicago’s American Academy of Art for a year, then transferred to Chicago State for a degree in English. He eventually dropped out and went on to produce his very first album, The College Dropout which was mostly about having the guts to embrace who you are rather than following the path that society has imprinted for you. Kanye got his big break in 2000 by becoming a producer for artists on Roc-A-Fella Records. He was super influential on Jay-Z’s album, The Blueprint where he produced 5 of the 13 tracks on there – more than any other producer. This is where Jay noticed the talent Kanye has and the bromance began. Following The College Drop-Out‘s success; the fashion mogul rewarded himself with an 18th-century aquarium – filled with 30 koi fish and a cherub-shaped gold fountain on a marble base in the centre. I guess that’s what his lifelong dream was? If you happened to miss Kanye’s strange little boogie during his performance at the foundation Louis Vuitton event in Paris in 2015, here’s a little preview. His robotic dance moves sent internet fans into a frenzy with people all over the world bashing his less than coordinated “body pop”. The rapper’s funny but strange robot-dance even became an internet phenomenon! 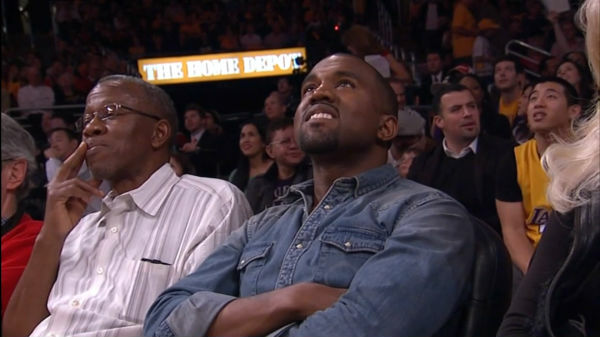 It’s best to leave the dancing to Breezy and focus on your lyrics, Ye! It’s no secret that Kanye has struggled with his mental health. He was even hospitalized in 2016 after suffering from “temporary psychosis”, paranoia and depression. Although this may have been triggered after his wife, Kim was robbed and held hostage, Kanye has admitted in the past that he once considered suicide. You’re probably already aware of Kanye’s very public feud with Taylor Swift. It all started when Kanye interrupted her acceptance speech at the MTV VMAs in 2009 stating that Beyonce deserved the award for Best Female Video instead. The latest drama revolved around his single, Famous where he rapped “I feel like me and Taylor might still have s*x. why? I made that b***h famous!” Taylor denied approving such a misogynistic comment and the drama escalated, with Kim even stepping in to defend her husband. It doesn’t look like their feud is due to end anytime soon. He’s a rapper, song-writer, record producer, fashion designer, artist, genius and visionary…what else could possibly be missing from Kanye’s resume? Hmm, a pornstar maybe? The multi-millionaire admitted that the thought of being a male pornstar crossed his mind. “That career choice popped into my head once or twice. Which guy doesn’t want that? Just sometimes in their life. This was my mentality before I was engaged.” Nothing seems to amaze us when it comes to the Louis Vuitton Don. The workaholic launched an online travel company called “Kanye Travel Ventures” (KTV) through his official website in 2008. He also dabbled in the food chain opening burger joints called ‘Fat Burger’ in Chicago that very same year. He opened a second before running into some financial problems and so he closed them down in 2011. Kanye truly struggled with his mother’s death and broke down mid-performance in Paris whilst rapping the song Hey Mama which was written about the most important person in his life. He really isn’t afraid to wear his heart on his sleeve and show who he truly is. Kanye is known for his “out-there” ideas, but this one shocked us all. While speaking at the 2015 MTV Video Music Awards in August 2015, Kanye finished his 13-minute monologue by revealing, “As you probably could’ve guessed by this moment, I have decided in 2020 to run for president.” Yeah, you read that right. Kanye has decided to change his career path. Who knew he had such high political ambitions? Mr Trump, watch your back. As crazy and outrageous as they are, these facts will make you love the loud-mouthed rapper a little bit more. He doesn’t shy away from who he is and puts it all out there for us to see. Want more on Kanye? Have a look at his craziest quotes – they promise to make you laugh…or cry.